While the word jihad is never spoken, its frightening theological implications as a physical struggle as well as its more disarming theological definition as a spiritual struggle are both on display. While I had heard prior to its release that some game journalists were concerned that Assassin's Creed could be controversial given that its protagonist is an Arab assassin, I was, nevertheless, both surprised and intrigued as the game loaded up that I was met with a rather unusual disclaimer for a video game: "This work of fiction was designed, developed, and produced by a multicultural team of various faiths and beliefs." The disclaimer is, perhaps, an effort to acknowledge the potential concerns that this game's content may have; however, it interestingly does have very real relevance on the game itself. Assassin's Creed is the first mainstream video game that I can recall that has dealt with both very real religious issues and very real religious politics in such an overt and sophisticated way, in both its narrative and its gameplay. Certainly, other plots in modern video games have considered religious issues and the politics surrounding them as rife with potential for plot and character motivation. In particular, Japanese games (I am thinking especially of the Final Fantasy series, particularly Final Fantasy X) have used fictional religions in their fantasy games that have interesting correlatives with modern religious issues. Some more Westernized games have as well, though again, those that I can think of (Star Wars games and the Halo series for example) tend to do so within fantastic worlds distancing themselves from the real life consequences of those who might be offended by extended critiques of religious beliefs and values and the role that they sometimes play in politics. In a sense, too, Assassin's Creed's main narrative does create an artificial or fictional boundary between itself and the real world. Despite its largely Middle Eastern setting, the game is couched within a metafictive frame-tale that seemingly sets the narrative at some distance from reality. Such a metafictive conceit is not a new one for a video game. Games like Hideo Kojima's Metal Gear Solid series have played around with the notion that a video game by its nature as a simulation of reality affords interesting opportunities to examine the relationship between the real and the artificial. Moments in those games, which play on the convention that the player is experiencing Solid Snake's "reality" via the distance of a game controller interface (such as when the player realizes in the first Metal Gear Solid title that in order to defeat Psycho Mantis, a mind reading opponent, we can only do so via very "real" physical means: by unplugging the controller from port 1 and moving it to port 2 in our PlayStation console so that the computer can no longer "read" the player's mind/actions rapidly enough to never allow Mantis to be hit), are ones laden with interesting postmodern notions that the boundaries between fiction and reality are thinner than we might think. You don't need to be Spider-Man to jump from the rooftops. Indeed, perhaps, Assassin's Creed's metafictive frame is one that brings the player closer to the main characters of the game, Desmond and his own simulated avatar, Altair, rather than distancing us from their actions. From the outset of the game, the player takes on the role of a character named Desmond who in some futuristic setting has been kidnapped by a multinational conglomerate and forced to enter a virtual reality machine called the Animus that simulates "genetic memories" latent in Desmond's DNA of the experiences of his ancestor, the assassin, Altair. This frame-tale immediately generates a sympathetic bond between ourselves (the player in a virtual reality) with the main character (a player in a virtual reality). Some of this sympathy, though, is tested by the arduous length of the tutorial sessions in the animus as we (and Desmond) are forced to play out and practice some of the basic skills of an ancient assassin in some rather tedious ways. While this metafictive conceit affords Ubisoft the ability to justify "unrealistic" elements of gameplay (when Altair dies, it is a result of a poorly loaded memory in the simulation that must be "reinitialized", allowing Desmond and the player to try again), I was initially less charmed by the conceit than aggravated. Metal Gear handled such elements more deftly and less didactically than Assassin's Creed initially does in its "hour-too-long" series of tutorial sequences coupled with intrusive loading and reloading of memories that do more to irritate the player (and maybe Desmond, too?) than to make us feel sympathetic to the experience. Frequently, the loading sequences, too, disrupt a sense of immersion in the simulated historical scenario. Though, perhaps this experience is appropriate given the extra layer of plot in the game. However, once the tutorial has been successfully surmounted and full reign is given to the player in taking on the role of Altair, the game becomes much more compelling, as do the infrequent but intriguing interludes between some chapters of Desmond's experiences with the scientists charged with discovering a secret treasure within the memories of Desmond through the use of the Animus machine. The setting of the game offers a rather unique experience both dramatically and intellectually. Seeing both the sprawling ancient cities of Damascus and Jerusalem (a third city that I am unfamiliar with, Acre, is also included) for the first time in a video game was a unique and rather awe-inspiring experience due to the beautifully detailed architecture and level of detail Ubisoft has paid attention to in order to document and generate these living and bustling cities and their denizens. Additionally, the complicated religious and political socio-economic landscape of these cities, which at the time were occupied at once by various European and Semitic ethnic groups and the faiths of Judaism, Islam, and Christianity, is fascinating to behold both within the architecture of these carefully crafted simulations themselves (from Jewish temples, to Muslim mosques, to Gothic cathedrals, you will find it all in the Holy Land of Assassin's Creed) as well as in the political scheming and intrigue that serves as backdrop to the series of stealth missions and assassinations performed by Altair. Religious and political strife is at the heart of the game, and its relevance in an era when so much of our political attention is on the Middle East can hardly be denied. While the word jihad is never spoken, its frightening theological implications as a physical struggle (actual violent actions taken to perpetrate "Holy War") as well as its more disarming theological definition as a spiritual struggle (an internal moral battle within the believer) are both on display through the actions of Altair as an assassin on a holy mission and as a man struggling with the actions of his activities and their moral consequences. How about a little bit of combat on horseback? While the game's disclaimer and lack of usage of words like jihad suggest some care in addressing the religious issues in the game, the developers should be commended for not shying away from some of the complex and thorny Muslim-Christian-Jewish "problems" arising in the Middle East during this period and today. Bravely, they acknowledge that some of the issues at stake in the Middle East are in part caused by the very real and very critical beliefs and values of a variety of very different religious faiths (an acknowledgment sometimes pooh-poohed by modern liberals who would like to define such conflicts as matters of politics and not at all religiously motivated in nature) while also acknowledging that some of these issues are simply pragmatic and political in nature (an acknowledgment sometimes pooh-poohed by modern conservatives who would like to define such conflicts as matters of religion and not at all pragmatic and political in nature). This even-handedness is refreshing as it offers insights into both positions, and illustrates the conflict of practical solutions balanced against highly volatile and deeply believed principles through Altair himself. 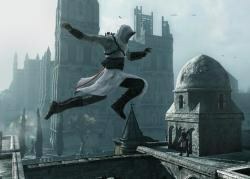 Altair initially believes that his mission is one justified by a philosophy and code defined by the traditions of his own sect. He feels that the political nature of his actions as he cuts down important but morally bankrupt citizens like slavers, influential merchants, and high ranking soldiers on all sides of the conflict is unimportant as the principle of peace that he is willing to kill for is more important than mere politics. However, one of his contacts observes that in assassinating such politically substantive men, "You are a politician, too, in your own." This statement is true enough, as Altair's philosophy and those of the assassins are having not merely moral but political effects on the region. 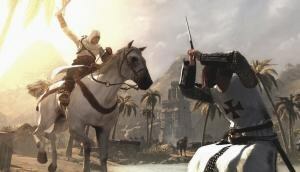 This realization precipitates a crisis of faith in Altair, especially as his mentor, the leader of the assassins, begins to suggest to him that the God that the Jews, Muslims, and Christians are all fighting over may not exist at all and that the role of the assassin is amoral in nature: "Nothing is true. Everything is permitted." This possibility that reality is all an illusion and that Altair has found himself in a solipsistic universe is equally supported by the frame-tale of the game. Indeed, in the Animus and in a video game, nothing is true and everything is permitted. Again bravely, though, Ubisoft does not allow for this simplistic and pragmatic a solution to stand. 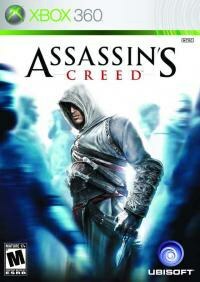 Altair's crisis is complicated by a loss of faith in the Order of the Assassins itself as he realizes the assassins' complicity in the power grabs going on between the warring factions. While he begins to fear that no one may be right as he confronted with the explanations of his victims justifying their actions for the greater good of the community (much as Altair has justified the notion of killing in the name of peace) and, thus, that all of these versions of God may be an illusion, he begins to realize the necessity for a code, a tradition, and a principle to define and justify his own behavior. When faced with the realization that the puppet masters behind the Holy War are killing not in the name of God, but in the same spirit as the assassins in order to build a more peaceful world, the hypocrisy of doing evil in order to generate a greater good becomes apparent to him. While others may have chosen to believe in their version of God, Altair recognizes, "At least they choose these phantoms." Altair's jihad, his personal struggle, becomes easily as interesting if not more so than the jihad he wages through assassination. He realizes that choice -- be it to deny gods and seek political resolution or to embrace gods and tradition -- is more important than being a slave to the ideology of others. What Altair's narrative may suggest is that while Desmond (and to some degree the players themselves given the scripted nature of their own experiences in Desmond and Altair's worlds) may not be free to escape the simulated world that the narrative forces them to play, perhaps, choices outside of the frameworks of media remediated reality -- ideologically bound as they are -- and the beliefs and values of others might be respected as choices that individuals make for themselves.